Ryan Doumit hit his second game-winning home run of the week, and while this wasn't of the walk-off variety, it was big nonetheless. 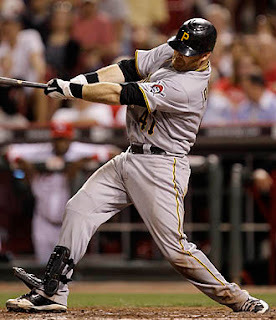 Pirates 2, Reds 1 was the final last night in Cincy, as the Buccos got a strong pitching performance from Paul Maholm (7 IP, 0 runs), and an RBI double from the freshly-recalled Neil Walker. Octavio Dotel pitched a scoreless inning for his 10th save and Joel Hanrahan picked up his first win, along with his first blown save of 2010 on a Brandon Phillips game-tying HR in the 8th. Roger Goodell will decide within a week whether or not Ben Roethlisberger can re-join the Steelers for offseason workouts, after reviewing the QB's behavioral evaluation. Sim and Tanveer Bhullar of the Kiski School check in at 7'4" and 7'2", respectively, so you're right if you guessed their sport of choice - basketball. How they got to Kiski, however, is verrry interesting, with the always-intriguing footprints of John Calipari lurking. "On January 25, 2010, Duquesne University announced the elimination of men’s swimming, along with baseball, wrestling and golf. The University cited Title IX (gender equity), as well as a desire to allocate additional funds to its core sports (basketball and football), as the reasons behind its decision. The unexpected announcement devastated both the men’s and women’s swim teams. Unified by the cause to reinstate men’s swimming at Duquesne, and a desire to stop the growing deterioration of the sport at the collegiate level nationwide, present swimmers, parents and alumni joined forces to formulate the Go for 5! program. Go for 5! has been Endorsed by the USA Swimming, College Sports Council, the College Swimming Coaches Association and Olympic Gold medalist, Josh Davis. Go for 5! is designed to show the amazing impact as little as $5.00 can have on the sustainability of collegiate swimming. All donations made to the Go for 5! program, run by the Duquesne Swimming Alumni Association, are tax deductible and details can be found on the website www.gofor5.org." Title IX: Example of Unintended Consequences of Government Intervention. As a former collegiate swimmer who's team recently got the axe (Clemson), this is the sad truth in college athletics. If you can put people in the stands, your program is (probably) going to survive (i.e. football and basketball)...otherwise...any and all programs are expendable. I love those NCAA commercials about student-athletes "going pro" in something other than sports. Yeah, that's great...but people, as a whole, don't care about those student athletes. So what if you were a college volleyball player? It's all about the BCS and NCAA Tournament...and the NCAA knows that, yet continues to perpetuate this facade. What a farce. FWIW, Clemson's situation wasn't Title IX related either as both men's and women's swimming are being cut. Pirates' starting pitching is really coming around... If we get rid of Aki's .160 BA from the lineup, maybe we could flirt with 70 wins? Get rid of Gonch... he played old as sh*t last season. Not worth the $$$ that he will command. Thanks for the good years gonch, but unfortunately they have passed. It doesn't seem that Gonch is going to be settling for a hometown discount. He has been great for 5 years, but I think his time in Pittsburgh is up. What's going to be interesting is how we address the wing position. When the Habs took away the middle of the ice, the big 3 had limited options as we lack the finesse scoring winger to expose that sort of system. I don't see anybody on the market, other than the unattainable Kovalchuk, that can fill that void. What an old grumpy man..Can’t wait till the old man Paterno moves on or passes so the great Pitt-Penn st rivalry can continue...this bitter old man for some reason can’t get past his grudge from many yrs ago (although to a man that dirt old it probably seems like yesterday). Having lived in Florida and seeing all the teams down there play each other every year (Miami, FL, FL st) makes me jealous that we can’t have a state rivalry game like they do...and please Penn st fans, don’t come back with the economics or we have more fans argument. This is strictly from a fans perspective and not just a Pitt fan, a college football fan who wants to see this classic rivalry started back up. Why would Paterno want to play Pitt(and possibly lose) when he can schedule mediocre FCS(I-AA) schools like Youngstown State (37-3), Eastern Illinois (52-3), or Coastal Carolina(66-10)? The big programs (and coaches) want that cushy home win. It helps their record, the blowout generates fan excitement, and the revenue payout to the opponent is half the price of an FBS team. Have any of the local talk shows/newspapers/bloggers made mention of the Pens considering making Malkin a winger and putting him on Sid's line? Doing so solves many problems: (1) you get the big-time scoring winger the Pens need (2) Staal jumps up to a second line center (3) no cap impact at all. It would probably bring out more consistent play from Malkin as well since playing on the same line as Sid should do that. Back in the 90's, I can't remember which season it was, but Ron Francis, a natural center, switched to a wing and played on Mario's line and good things happened. I honestly don't blame Penn State if they can get 8 home games and fill their place up. I can't stomach watching cupcake games, but obviously many are fine with it. The baseball game was very enjoyable. Quick, good pitching, and clutch moments late. I think part of the Pens strategy is to have 3 quality lines. Part of the secret to their success is having a quality 3rd line that makes it tough for teams to match up with them. And Malkin has played on Crosby's line at times in the past, so I'm thinking they just prefer to have him center his own line. And you have to admit, he's a pretty great center in his own right. I wish PSU played Pitt too but its not gonna happen. And its not just PSU scheduling cupcakes, Pitt does it too. The New Hampshires and FIUs of the world won't exactly put up a fight. Also in reference to Florida teams playing each other every year, Florida and Miami have only scheduled each other 3 times in the past 23 years. Even those teams started scheduling cupcakes. I agree with you. I think they believe three quality lines are hard to stop. I like Gonch, but not at an exorbitant price, financially or in terms of contract length. I would like to see them go after Volchenkov to steady up the D and someone like Peter Regin as a low cost option at wing. Ultimately I think Tangradi will play on Sid's line. Do you think they will take a run at Army given his potential issues in Atlanta? Those first few minutes of the JoePa interview were a bit awkward when they had to explain to him what "radio" was. You're a sick person if you'd hope that JoePa "passes" so that two teams can play each other in football. And memo to NickDawg, we're not playing you with OR without Joe. Get over it. I agree it's not right to hope for death, especially to someone like Paterno. P.S. @ Clint Pitts: I wasn't implying that PSU is the only one scheduling cupcakes. I got suckered into upgrading for club seats this year at Heinz for Pitt, and for three seats want to gag when I see that schedule. If Pitt is re-added to the schedule, it's not going to be for anything more than two years. Also, while we're on the subject of scheduling, Joe said during the spring game that Bama is the only SEC team that would come to the Valley. Just an interesting tid-bit. Adam since you are apprently the know all end all of PSU (or just a jock sniffer) and can see into the future, is 2012 really it...go back to your moms basement and continue eating boogers..and yes I hope Jopa Dies real soon and if that makes me sick, I dont want to be well.. If anybody is going to deny that Pitt and PSU is a great rivalry, they are either a PSU elitist (Adam) or mildly retarded ( ironically, also Adam). I am in no way saying those 2 are synonymous, just in Adam's case. Every program in the top 40 schedules cupcakes early in the season. That's the reason I don't think anybody should be ranked until they have played a portion of their conference schedule, as well.